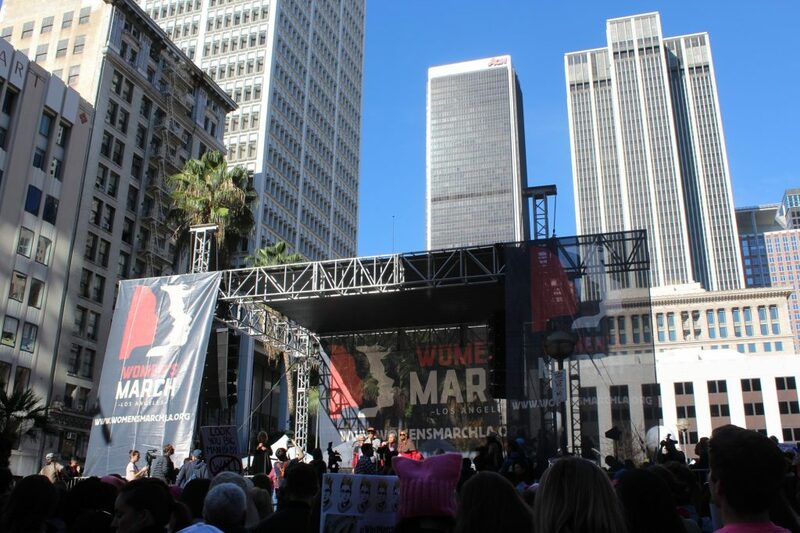 Thousands of people flooded the streets of Downtown Los Angeles to participate in the third annual Women’s March. 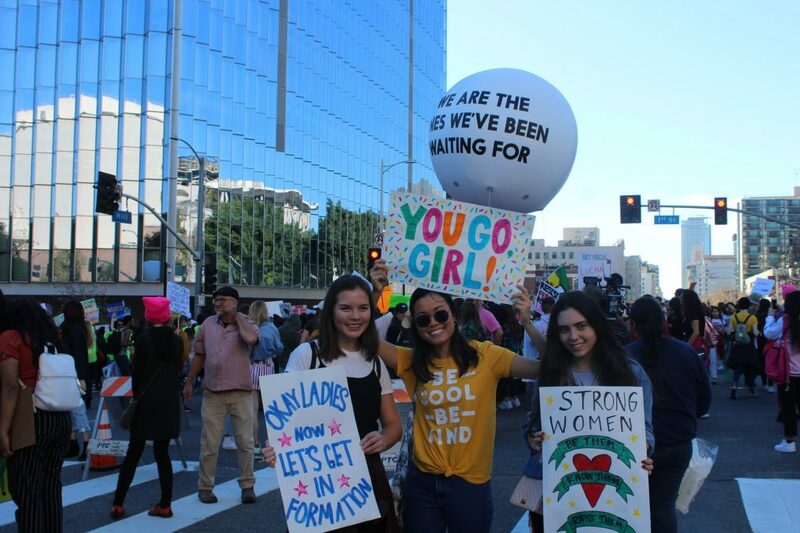 As Women’s Marches happened nationwide, Los Angeles was no different. Armed with posters of all colors, shapes and sizes, a sea of people of all ages, wearing pink hats, butterfly wings and sassy T-shirts joined together to make a statement on Saturday, Jan. 19. 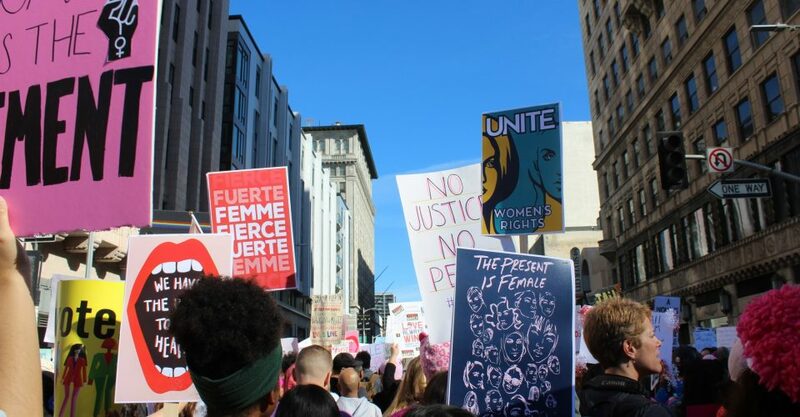 The event began at Pershing Square at 9 a.m., and participants began marching toward City Hall after 10 a.m. People chanted as they marched and Pepperdine students were among the local protestors. 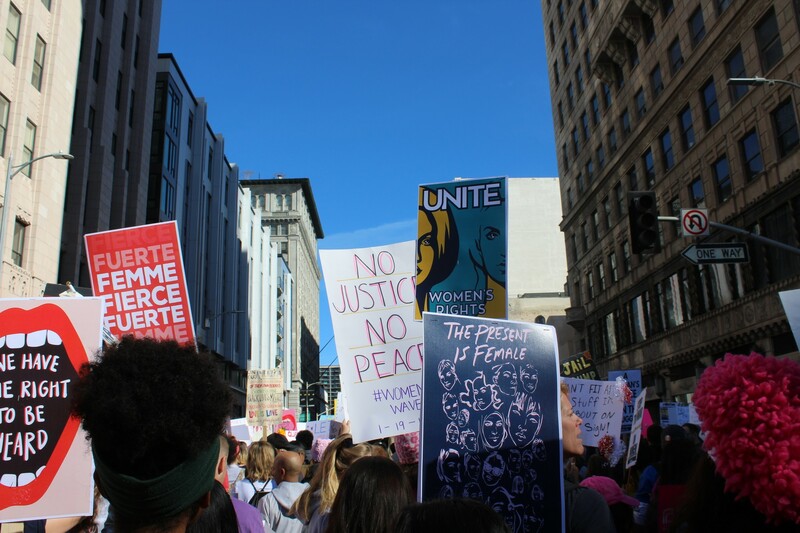 Many signs advocated for equal pay, one of the biggest issues women face, along with sexual harassment and period poverty. Despite the controversy surrounding the board of the Women’s March regarding anti-Semitism after Women’s March organizer and co-president Tamika Mallory attended a speech by the Nation of Islam’s Louis Farrakhan. However, thousands continued to gather downtown. Allison Crisitio, 25, marched in 2018 as well and said she was aware of the controversy but didn’t let it stop her from joining. 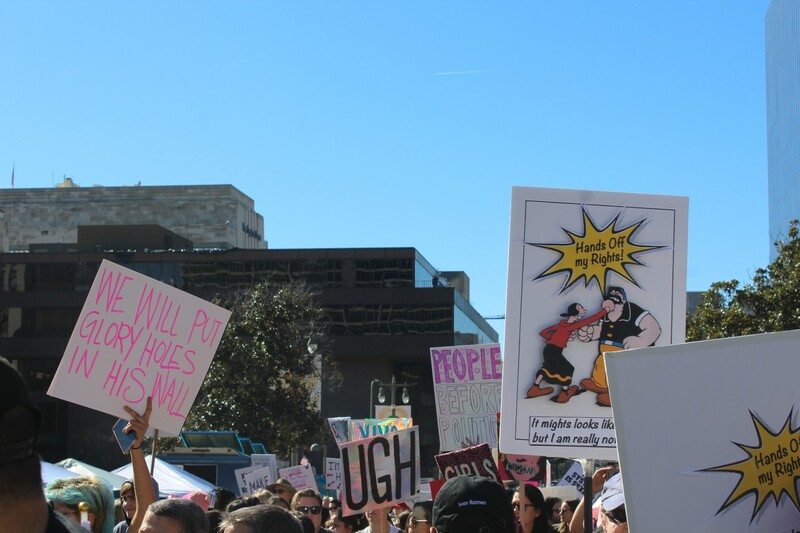 “There were a lot more people out here [this year] not just for women’s rights but getting Trump out of office and trying to make that possible for everyone,” Cristio said. The event kicked off with speeches to pump up the crowd at Pershing Square. Spokespeople included: Nury Martinez, Assistant President Pro-Tem of Los Angeles City Council; Gloria Allred, founding partner of the law firm of Allred, Maroko & Goldberg; and Patti Giggans, executive director of Peace Over Violence, among others. The crowd continued to cheer as more speakers gave motivational speeches. 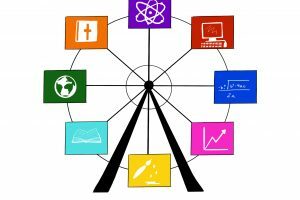 “We are going to continue to speak truth to power; we are the change we wish to see in the world,” Allred said. 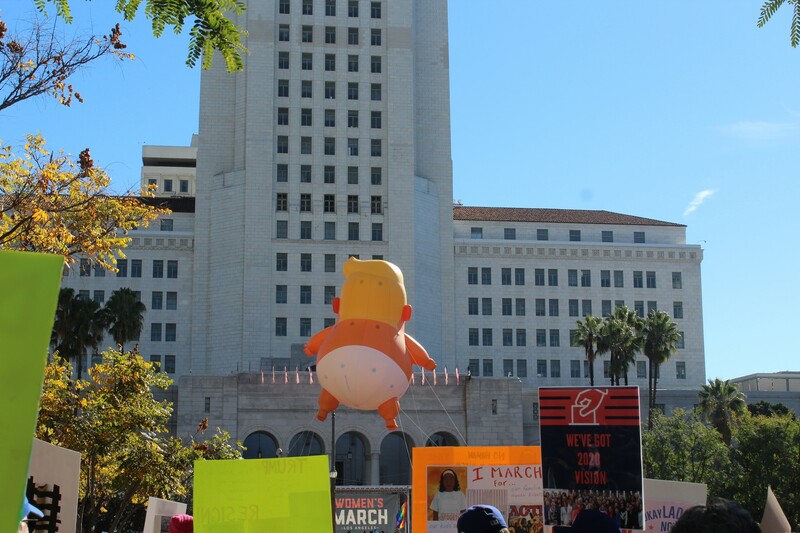 As the march ended at City Hall, protestors gathered to hear speeches from celebrities and politicians, including Laverne Cox, Connie Britton, Laura Dern and Mayor Eric Garcetti. Equal rights were important to crowd members alike. Junior Aliya Edwards said this was her first Women’s March, but that she had a good time. Meanwhile, this was Nabor’s third Women’s March, and he was one of thousands of men who came to support and be an ally to women. “Women are of equal dignity and respect as men, and if men are rewarded that, then women should be as well,” Nabor said.